Our beautiful bespoke signet rings are exclusively supplied by Hancocks of London, the world famous firm of English jewellers. You can order a traditional Oxford oval signet ring seal engraved with your chosen family crest directly and securely online. Hancocks can also make almost any custom order signet ring seal engraved with your personal design, initials, crest or coat of arms. So if you are looking for a ring set with seal engraved hardstone, such as cornelian, blue agate or bloodstone; or for a different shape ring, such as rectangular or square head, then just give Hancocks a call to discuss your ideas. 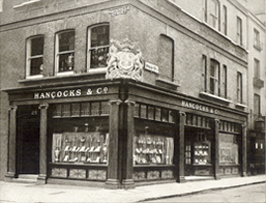 After all, they have been making signet rings of all shapes and sizes for over 150 years. 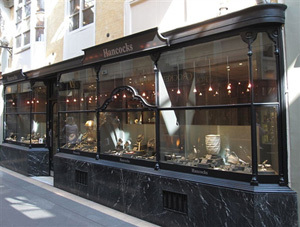 Hancocks have supplied bespoke gold and gem set signet rings and cufflinks since 1849, making the firm probably the world's longest continuous supplier of these traditional English jewels. Today, wherever you are, you can join that history by ordering the classic style Oxford oval signet ring engraved with your family crest directly from Hancocks at myfamilysilver.com.